Title: COOK WITH THE CROOK! Another bog-standard 419 email comes in, but this time I decide to test the scammer cooking abilities! Export Promotion Council. I and my colleagues are officials in charge of offshore remittance in this Corporation (NNPC). We are seeking your assistance to transfer of Forty Two Million (US$42,000,000.00) to your account for further private investment. This amount accrued from an over-invoiced contract amount for the construction of an Oil Refinery Sub- Stations in Nigeria in 1999. The contract was valued for one Hundred and Twenty Seven Million United States Dollar (US$127,000,000.00), but we manipulated the figure to read one Hundred and Sixty Nine Million United States Dollars($169,000,000.00) The extra $42,000,000.00 is what we want to transfer now. This contract has been completely executed and the contractors have been paid their contract less this $42,000,000.00. which is in a suspense account with the Central Bank of Nigeria, the nations apex bank. For your assistance, we have agreed to remunerate you with 15% because it is impossible for us to claim the amount without foreign collaboration. 5% has been mapped out for any miscellaneous expenses that may be incurred by either party during this business. concrete agreement between us, should you be willing to do this deal. confidentiality. You can rest assured that your security has been considered before you were contacted. First a little information about myself and my company. My Name is Mike Lord and I have been working in this industry for nearly 25 years. My company is called Shiver's Bakeries and we produce high class and exclusive cakes and confectionery for sale through our 3rd party distributors worldwide. I own 5 manufacturing plants and presently our annual profits are around £8.4 million UK pounds per year, and I employ just over 400 workers. In fact this year is a very special year for us as this is my business's 25th birthday. On may 24th 2004 my company celebrates 25 years in business. To return to your proposition. As I have indicated, I am very interested in your proposition, but before I would be willing to proceed or give out any private information I will require that you are able to send be some definite proof of your identity on some manner that cannot be faked. As I have stated previously, a passport or other ID will not be acceptable, as we have previously had some dubious people contacting us to send us false information and passport details, so I am afraid that such identification cannot be accepted. I am happy to help you financially in this respect if needed as being experience in business I do know that transfers of such large amounts of money may require substantial processing fees, but first you will have to prove your identity to me. I am afraid that without proof of your identity I will be unwilling to proceed. My terms above are absolutely non negotiable. I do apologise if this offends you but I have to be extremely careful when dealing with such large amounts of money and with people I have never met. I am a very wealthy man, and sadly some people try to take advantage of this fat. This identity request may seem a little strange, but are you able to bake or purchase a large cake of any description? As I have explained above, cake making is my company's speciality, and a indisputable way to prove your identity to me would be to send a photograph of yourself holding a cake. Perhaps you could decorate the cake with a pre-agreed password? This would serve well as identification as there is absolutely no way that anyone else would be able to duplicate this and also it would be something that is associated with my company. Thank you for your mail and your interest in my proposal. I wish to state that the content of your mail is well understood. Firstly, I and my colleagues have delibrated on your capability/confidentiality in handling this business and they consent I proceed with you as your operation oversea will provide lead for viable investment. I shall send the picture to you, and you will also do thesame by hold a sign in your hand boldly written Dr Denison Eze, and send it to me by attachment. Furthermore, I would like to inform you that due to our tighth schedule we cannot afford to meet with you in england for now as we will not be alow to apply for leav twice within the short period. Please reply to this email box. Thank you as I look forward to hearing from you soon. Thank you for your very positive reply, and I am sure that we will be able to proceed with your proposition very quickly once I am satisfied of your identity. As I have already told you, I will be happy to send my picture identification in any manner you choose, after yours is received. As I told you in my previous email I require identification in a manner that cannot be forged. As explained, because this year is the 25th anniversary of my bakery business, the ideal way to prove yourself to me would be to have your photograph taken holding a cake (as this is what we make). May I make one request for the cake that would please me very much? 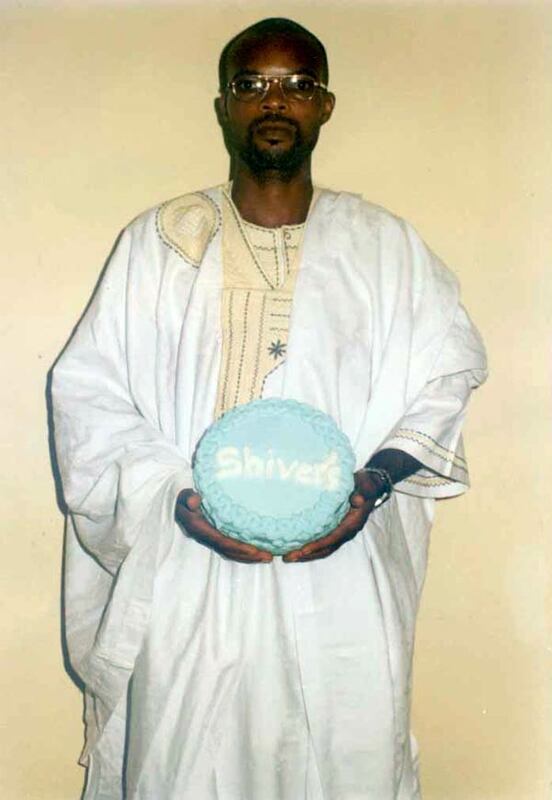 If you can photograph yourself with the cake, and have the word SHIVER put onto the cake, that would obviously be absolutely indisputable proof that the image is indeed yourself, and would be an honour to me also. [Nothing wrong with being honoured] I would be very appreciative of your efforts if you would be able to do this for me. I must insist that the picture you send is to me large and clear so that the cake, yourself and the word SHIVER can be clearly seen. Please rest assured that you can fully trust my secrecy and honesty in this endeavour. I would never do anything that would harm the good reputation of my company. As you say, there is not much time to be wasted here, so as soon as you are able to come forward and supply the identification I request then I am ready to proceed immediately. Thank you for your mail . I will send you the photo, It would be nice if I hold your name on my other hand and snap the pic . In a short time you will got it. Thank you for your preparedness to assist bring this business that will give us financial gratification to fruition. As I have already stated, I will be happy to send you my own picture in whatever way you prefer. All that is required by me is that you send me your picture identification in the manner I previously requested. Once I have received that I will be happy to send you my own picture. I think that this is very fair considering that it was you that contacted me first. I will send to you immediately. Thanks for your email and I shall be ready to contact you immediately that your picture is received. THANKS FOR YOUR CO-OPERATION AND HAPPY ANNIVERSARY. FIND ATTACHED THE PHOTO FOR YOUR IDENTIFICATION. Many thanks buddy for the picture you sent to me, and I am happy to confirm it is 100% acceptable. I am now ready to participate in your proposition. Please inform me how you wish to continue? Denison never replied. Did his get food poisoning from having a sneaky taste of my cake? Did he get suspicious? I don't know, but at least we both gained something from this experience; I got a cake, and Denison learned how to bake!